Two friends awaken a world of myth and magic in this clever middle grade fantasy perfect for fans of Rick Riordan and Anne Ursu. Gah. I'm really not a fan when a book claims to be "for fans of X and Y." Then I go in thinking I am going to read that other book, and it influences my opinion of what I'm reading. Anyone else feel that way? Anyway, I really enjoy reading books based on Greek mythology, as it has been a trend to publish YA novels based on these stories. But that can only be done so much, and now it looks like the trend is to turn to other cultural myths. 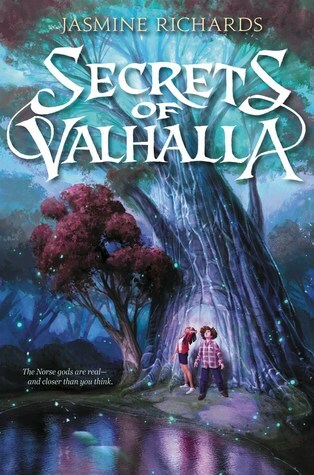 This is my first experience (that I can recall) reading a book based on Norse mythology, and I thoroughly enjoyed it. I struggled in the beginning of the book, but I understand it was necessary background and character introduction. However, I didn't really start enjoying the story until Buzz and Mary were traveling amongst realms and trying to save the world. The two kids went to the sky, to the sea, and the underworld, and all of these settings were wonderfully described. There were several plot twists in the story -- some were predictable, but some really did take me by surprise. I did have to remind myself while reading, though, that this is a middle grade story, and so wasn't as rich with some of the character depth and detail that I'm used to with young adult. Finally, I always have to acknowledge and appreciate a beautiful standalone story when it comes along, because sometimes I like to read a book and then set it down with everything wrapped up and the world and characters in a good spot to say goodbye. Thank you to Harper Collins for providing me with an Advanced Reader's Copy in exchange for my honest review. This is such a cute little book for children! I originally purchased this for a completely different reason that was actually work related, but when I read through the book I found that I loved it! I love the perspective that offers young readers on ancient mythology and how it puts it all on a level that they understand- great read for young minds!